This year’s event runs from Thursday, September 19th through Saturday, September 21st, 2019. The 5K starts Friday at 6:30 pm, the 10K at 6:30 am Saturday, the wheeled marathon at 7:25 Saturday, and Full Marathon and Half Marathon at 7:30 am, Saturday. The first official marathon was held on September 20, 1997, celebrating the 50th anniversary of the Air Force, and is held the third Saturday in September each year. The marathon course is a 26.2-mile run that traverses historical places on Wright-Patterson Air Force Base, including the National Museum of the United States Air Force, the Air Force Institute of Technology, Headquarters Air Force Material Command, the Wright-Patterson AFB flight line, Huffman Prairie Flying Field, and the Wright Brothers Memorial Monument. Team Fisher House organizes the Fisher-Nightingale Houses involvement with the Marathon. 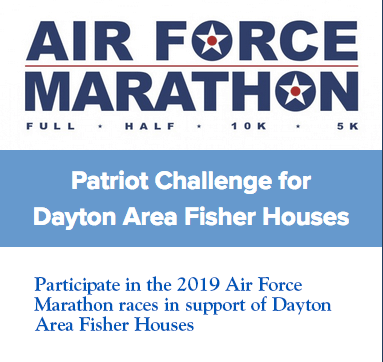 This year Team Fisher House has created The Patriot Challenge, designated for those who would like to raise funds and awareness for Fisher-Nightingale Houses, Inc. while participating in the 2019 Air Force Marathon races. This fundraising campaign is designed to make your fundraising experience easy, fun, and meaningful. » Get details and sign up for any 2019 Air Force Marathon race distance on the race website here. » Register to run or volunteer for the Patriot Challenge here. The Team Fisher House Patriot Challenge in the Air Force Marathon benefits the three Dayton area Fisher Houses.